Domenikos TheotokopolosEl Greco (1541 – 7 April 1614) was a painter, sculptor and architect of the Spanish Renaissance. "El Greco" (The Greek) was a nickname,[a][b] a reference to his ethnic Greek origin, and the artist normally signed his paintings with his full birth name in Greek letters, Δομήνικος Θεοτοκόπουλος (Doménikos Theotokópoulos), often adding the word Κρής (Krēs, "Cretan"). El Greco was born on Crete, which was at that time part of the Republic of Venice, and the centre of Post-Byzantine art. He trained and became a master within that tradition before travelling at age 26 to Venice, as other Greek artists had done. In 1570 he moved to Rome, where he opened a workshop and executed a series of works. During his stay in Italy, El Greco enriched his style with elements of Mannerism and of the Venetian Renaissance. In 1577, he moved to Toledo, Spain, where he lived and worked until his death. In Toledo, El Greco received several major commissions and produced his best-known paintings. Born in 1541, in either the village of Fodele or Candia (the Venetian name of Chandax, present day Heraklion) on Crete, El Greco was descended from a prosperous urban family, which had probably been driven out of Chania to Candia after an uprising against the Venetians between 1526 and 1528. El Greco's father, Geórgios Theotokópoulos (d. 1556), was a merchant and tax collector. Nothing is known about his mother or his first wife, also Greek. El Greco's older brother, Manoússos Theotokópoulos (1531 – 13 December 1604), was a wealthy merchant and spent the last years of his life (1603–1604) in El Greco's Toledo home. El Greco received his initial training as an icon painter of the Cretan school, the leading centre of post-Byzantine art. In addition to painting, he probably studied the classics of ancient Greece, and perhaps the Latin classics also; he left a "working library" of 130 books at his death, including the Bible in Greek and an annotated Vasari. Candia was a center for artistic activity where Eastern and Western cultures co-existed harmoniously, where around two hundred painters were active during the 16th century, and had organized a painters' guild, based on the Italian model. In 1563, at the age of twenty-two, El Greco was described in a document as a "master" ("maestro Domenigo"), meaning he was already a master of the guild and presumably operating his own workshop. Three years later, in June 1566, as a witness to a contract, he signed his name as μαΐστρος Μένεγος Θεοτοκόπουλος σγουράφος ("Master Ménegos Theotokópoulos, painter"). Most scholars believe that the Theotokópoulos "family was almost certainly Greek Orthodox", although some Catholic sources still claim him from birth. Like many Orthodox emigrants to Europe, he apparently transferred to Catholicism after his arrival, and certainly practiced as a Catholic in Spain, where he described himself as a "devout Catholic" in his will. The extensive archival research conducted since the early 1960s by scholars, such as Nikolaos Panayotakis, Pandelis Prevelakis and Maria Constantoudaki, indicates strongly that El Greco's family and ancestors were Greek Orthodox. One of his uncles was an Orthodox priest, and his name is not mentioned in the Catholic archival baptismal records on Crete. Prevelakis goes even further, expressing his doubt that El Greco was ever a practicing Roman Catholic. In 1577, El Greco emigrated first to Madrid, then to Toledo, where he produced his mature works. At the time, Toledo was the religious capital of Spain and a populous city with "an illustrious past, a prosperous present and an uncertain future". In Rome, El Greco had earned the respect of some intellectuals, but was also facing the hostility of certain art critics. During the 1570s the huge monastery-palace of El Escorial was still under construction and Philip II of Spain was experiencing difficulties in finding good artists for the many large paintings required to decorate it. Titian was dead, and Tintoretto, Veronese and Anthonis Mor all refused to come to Spain. Philip had to rely on the lesser talent of Juan Fernándes de Navarrete, whose gravedad y decoro ("seriousness and decorum") the king approved. However, he had just died in 1579; the moment should have been ideal for El Greco. Through Clovio and Orsini, El Greco met Benito Arias Montano, a Spanish humanist and agent of Philip; Pedro Chacón, a clergyman; and Luis de Castilla, son of Diego de Castilla, the dean of the Cathedral of Toledo. El Greco's friendship with Castilla would secure his first large commissions in Toledo. He arrived in Toledo by July 1577, and signed contracts for a group of paintings that was to adorn the church of Santo Domingo el Antiguo in Toledo and for the renowned El Espolio. By September 1579 he had completed nine paintings for Santo Domingo, including The Trinity and The Assumption of the Virgin. These works would establish the painter's reputation in Toledo. Lacking the favor of the king, El Greco was obliged to remain in Toledo, where he had been received in 1577 as a great painter. According to Hortensio Félix Paravicino, a 17th-century Spanish preacher and poet, "Crete gave him life and the painter's craft, Toledo a better homeland, where through Death he began to achieve eternal life." In 1585, he appears to have hired an assistant, Italian painter Francisco Preboste, and to have established a workshop capable of producing altar frames and statues as well as paintings. On 12 March 1586 he obtained the commission for The Burial of the Count of Orgaz, now his best-known work. The decade 1597 to 1607 was a period of intense activity for El Greco. During these years he received several major commissions, and his workshop created pictorial and sculptural ensembles for a variety of religious institutions. Among his major commissions of this period were three altars for the Chapel of San José in Toledo (1597–1599); three paintings (1596–1600) for the Colegio de Doña María de Aragon, an Augustinian monastery in Madrid, and the high altar, four lateral altars, and the painting St. Ildefonso for the Capilla Mayor of the Hospital de la Caridad (Hospital of Charity) at Illescas (1603–1605). The minutes of the commission of The Virgin of the Immaculate Conception (1607–1613), which were composed by the personnel of the municipality, describe El Greco as "one of the greatest men in both this kingdom and outside it". 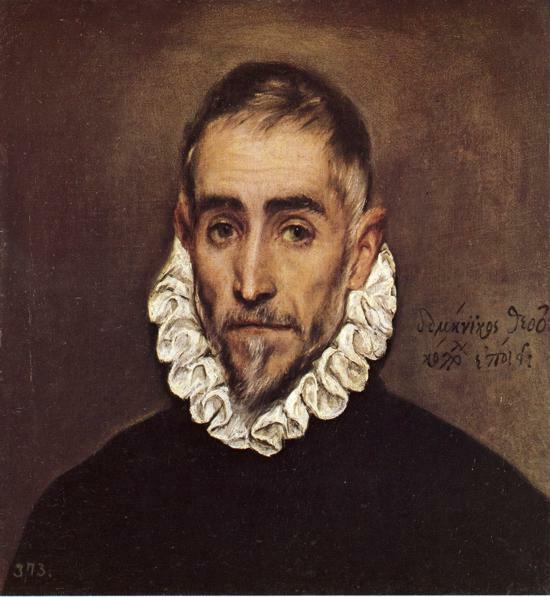 Between 1607 and 1608 El Greco was involved in a protracted legal dispute with the authorities of the Hospital of Charity at Illescas concerning payment for his work, which included painting, sculpture and architecture; this and other legal disputes contributed to the economic difficulties he experienced towards the end of his life. In 1608, he received his last major commission: for the Hospital of Saint John the Baptist in Toledo. El Greco made Toledo his home. Surviving contracts mention him as the tenant from 1585 onwards of a complex consisting of three apartments and twenty-four rooms which belonged to the Marquis de Villena. It was in these apartments, which also served as his workshop, that he passed the rest of his life, painting and studying. He lived in considerable style, sometimes employing musicians to play whilst he dined. It is not confirmed whether he lived with his Spanish female companion, Jerónima de Las Cuevas, whom he probably never married. She was the mother of his only son, Jorge Manuel, born in 1578, who also became a painter, assisted his father, and continued to repeat his compositions for many years after he inherited the studio. In 1604, Jorge Manuel and Alfonsa de los Morales gave birth to El Greco's grandson, Gabriel, who was baptized by Gregorio Angulo, governor of Toledo and a personal friend of the artist. During the course of the execution of a commission for the Hospital Tavera, El Greco fell seriously ill, and a month later, on 7 April 1614, he died. A few days earlier, on 31 March, he had directed that his son should have the power to make his will. Two Greeks, friends of the painter, witnessed this last will and testament (El Greco never lost touch with his Greek origins). He was buried in the Church of Santo Domingo el Antigua, aged 73.